Trevor Fleming and Reid Stewart breathed existence into Lifetime Collective in 2002. It was under a humming single light bulb within a shabby basement apartment that the first pieces of Lifetime Collective clothing began to take shape. From there, it grew to a collaborative group effort that was built on the backs of buddies and local artists. Quality clothing has always been the focus as Lifetime Collective draws inspiration from the communities they live in, places they travel, and people they meet. All in all, it is really a family-spirited brand that follows the unique paths of life and celebrating the journey along the way. Just as that road is ever changing, so is Lifetime Collective as they define themselves as a work in progress. Your shirt is your first impression. It is a statement about who you are and what you stand for. That is why Lifetime Collective shirts are all created with expression as the primary driving force. When you’ve got this much style and comfort, you make all the rules. The Lifetime Collective Josip Sweater is a 100% cotton pullover piece of excellence. This fine knit sweater rocks a super deep V and an overlapping front panel that features some sweet buttons. There is even a side pouch pocket for stashing your essentials for successful session across the board. You need a set of trousers that does work to flatter your figure, keep you looking good, and stay comfortable all day long. Say hello to the Lifetime Collective Women’s Konichiwa Zip Pants. These skinny jeans are perfect for any occasion from a shift at the office to a night on the town. They promise to look fly no matter what life brings your way, so what more could you want? Lifetime Collective clothing isn’t the only thing to get pumped about. Their accessories are pretty legit as well. 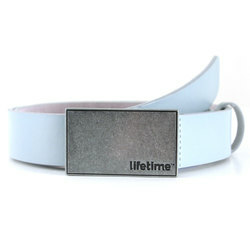 The Lifetime Collective belts are pure pieces of prime pant security. The Movement Belt and Women’s Pierre Belt are both perfect examples of the stylish functionality that this company packs into everything they get their hands on. Exploring life and celebrating its challenges, Lifetime Collective clothing is there with you through the journey. Reliable quality and fresh styles keep you going strong and looking good wherever your path leads.